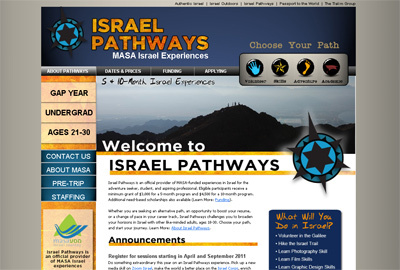 Israel Pathways is an official provider of MASA-funded experiences in Israel for the adventure seeker, student, and aspiring professional, ages 18-30. Eligible participants will receive a minimum grant of $3000 for a 5 month program and $4,500 for a 10 month program. Additional needs based scholarships are also available. Web Symphonies is a web development company that specializes in custom web development, search engine optimization, graphic and website design, and database development.